Ben Berkowitz, CEO of SeeClickFix, at the company’s New Haven office. When I met Ben Berkowitz in a New Haven cafe to talk about the SeeClickFix platform his company developed, I figured we’d walk around the neighborhood so I could see how the app worked. The app guides users to report problems such as broken curbs and illegal dumping to a city or town. The municipality, in this case New Haven, can then communicate back to users through email directed by the app. If we could find a problem to report, we’d have the full experience in real time on a rainy Tuesday. After 10 years in business, SeeClickFix has about 330 clients, mostly cities and towns — including Chicago, San Francisco, Houston and Detroit — along with some universities and other organizations with campuses. Berkowitz, 39, founded SeeClickFix with three partners — including Miles Lassiter, the founder of Higher One — after he had trouble finding anyone in city hall who cared about graffiti on a building in the neighborhood where he lived a dozen years ago, near Modern Apizza. 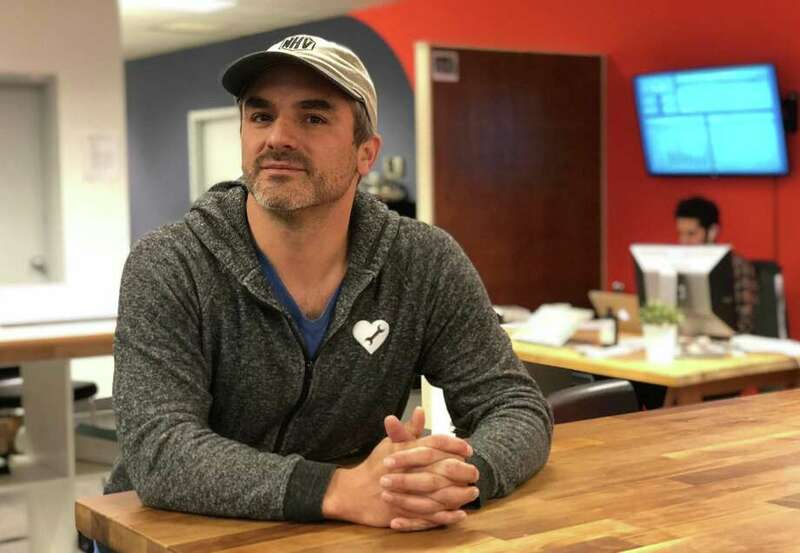 Now Berkowitz, who lives with his family on the same street where he grew up in the Westville section of New Haven, is a key player in the city’s software scene with 34 SeeClickFix employees downtown. He’s an active board member and former president of MakeHaven, the makerspace located in the same building as his firm. Gaudett and officials in other cities all said there’s no way to measure the cost savings because the platform touches so many departments and replaces old enterprise computer systems. And, as Gaudett said, it’s about responding more, not necessarily spending less. So it’s as much a cultural change as a system upgrade. Taking the app for a spin with Berkowitz, we find — surprise — that we don’t even need to leave our window seats at the cafe. Right across Orange Street, at the entrance to a Mediterranean restaurant and hookah lounge, is a honking rip in the curb and sidewalk, partly covered by an old, shoddy, asphalt repair job. Berkowitz shoots a picture of the mess right through the G Cafe window. He uploads it to the SeeClickFix system, reporting it as a curb and sidewalk repair issue. Almost instantly, the city responds with an automated comment, showing that up to four users have previously reported the same issue. We find the first complaint, with a picture, submitted exactly a year ago — showing pretty much the same damage. Unfortunately, SeeClickFix hasn’t developed an app that pours cement, sets granite curbs, cleans up illegally dumped trash, trims trees and fills potholes. We enter my email address and I start receiving updates. The following day, I see more reported issues on the same block. On Friday morning, I’m told about a parking ban on the odd side of the street. Someday I’ll learn the curb we reported is fixed. Good stuff. And best of all for SeeClickFix, the company doesn’t have any direct competitors who do what its platform does in the same way. From what I can tell, the cost of SeeClickFix — between $10,000 and $60,000 per year depending on lots of factors (the app is free for users, of course) — is many times less than the value it brings. Maybe the firm could charge a lot more. In Bridgeport, it’s handling more than 600 notifications a month. In St. Petersburg, 30,000 a year, and both places said the app is growing fast. New Haven, the flagship city, is also huge. Cities report 10 percent or more of residents connected. So why isn’t SeeClickFix already adopted universally, with hundreds of programmers and engineers ensconced on Chapel Street, where the company is about to move into new offices? The company, in fact, had to cut back on a marketing department that was making cold-calls to would-be customers. It’s still early in the science of civic engagement. After I left, Berkowitz and his team heard a report from an MIT student doing his Ph.D. dissertation on the effectiveness of city outreach and engagement, using SeeClickFix as the source of data and commentary. “When you’re at the beginning of something it takes time to get traction,” Berkowitz said.